Thanks to Gwen Stefani, I can actually spell b-a-n-a-n-a, so that’s good. The problem I have with bananas is that I hate them. I blame the banana-flavored numbing goo my childhood dentist used and the horrid taste of the banana itself. Monkeys only eat bananas because they have never had a pepperoni pizza. Since I loathe bananas, I am utterly unable to buy them for my daughter, who happens to love them. They are always too green to eat or too ripe ending up “squishy and with super gross black dots” as my daughter tells me. 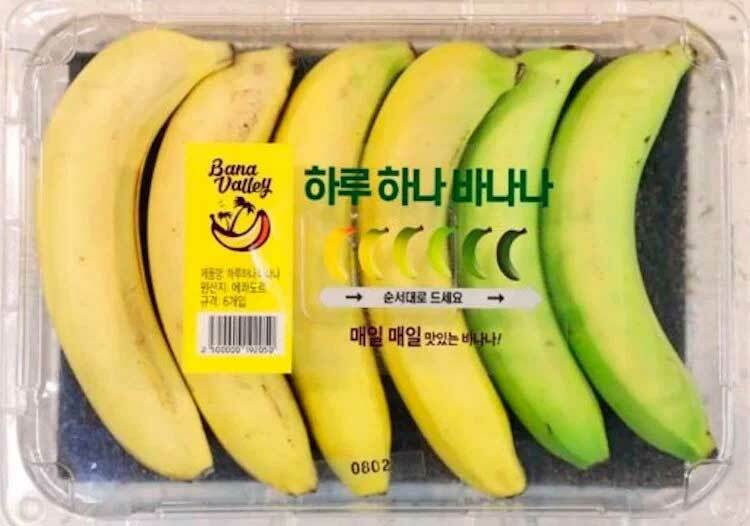 Leave it to the Koreans to improve banana technology for the good of all mankind. This package comes with six bananas of varying ripeness so you can eat them each day at the peak of ripeness and sans gross black spots and squishy parts. Now if only those Korean banana scientists could just explain to me what the deal is with those stringy things running down the side of a banana, and why we haven’t used genetic engineering to get rid of them yet.